Access to eight (8) Mercenary Hero slots. Now you can adventure alongside other characters from your account and create a unique and fully customizable party. 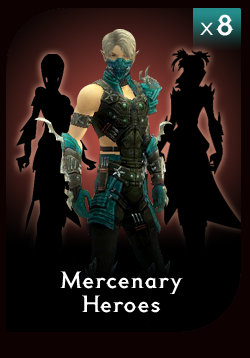 Purchasing a Mercenary Hero Complete Pack allows you to "hire" any eight level 20 characters on your account as Heroes! How to redeem - Once the Mercenary Hero Complete Pack serial key is applied to your account, speak with the [Mercenary Registrar] located in the Great Temple of Balthazar, Lion's Arch, Kaineng Center, Kamadan, and the Eye of the North. This NPC will tell you which characters on your account are eligible to become Mercenary Heroes. The Mercenary Hero slots are account-based and are available to all characters on your account.